Today, February 1st, 2012, the Community Redevelopment Agency (CRA) officially closed its doors, abandoning uncompleted projects such as the one planned for the vacant lot that was formerly the Bethune Library. The pending project, Bethune Crossroads, would maintain the integrity of the lot’s community-serving purpose in the form of a multi-use development project, providing 55 much needed quality affordable family homes, a fresh grocery, 25 permanent jobs and over 100 jobs in construction. As far as The State of California is concerned, the land is now up for sale to the highest bidder. Thats why, on this beautifully sunny Los Angeles morning, a group of around 50 people, composed of local community members, non-profit organizations including Esperanza, TRUST South LA, Abode Communities, SAJE, and St. Mark’s Lutheran Church, convened in front of the Vermont and 36th St. lot to express their concerns at a press conference held by T.R.U.S.T. South LA. Together they chanted “Housing is a Human Right!” holding signs such as “Esta tierra pertenece a la comunidad”(This land belongs to the community) and “Stop the displacement!” Community stakeholders and residents spoke to their history in the neighborhood, the developments they have seen, and the importance of holding onto land once promised not only for affordable housing, but at least for the benefit of its current population. Longtime resident and community leader Rosa Giron spoke about the changes her family has experienced over the last 30 years in the neigborhood. She, along with many other residents present at the press conference, have watched the area transition from what was once a grand majority of family-occupied housing 10 years ago, to a grand majority of student-occupied housing today. Current tenants are already being pressured out of the neighborhood by USC’s expansion and inadequate student housing stock; the loss of this project and its anticipated quality affordable housing would have dramatic and lasting effects on the face of this neighborhood, which many families have called home for decades. Robin Hughes, President and CEO for Abode Communities, added that the loss of the project will result not only in the loss of affordable housing, but of jobs, diversity, and voice. To find out how to get involved or for more information contact info@trustsouthla.org. By: Sophia Kandell, Esperanza Public Allied. Spirits were high as a surge of hope and anticipation pulsed through the air when guests began arriving at Mercado La Paloma, a bustling marketplace and economic development project in South L.A. that houses various vendors, services, and non-profits, for its 10th anniversary fundraising event on Friday. 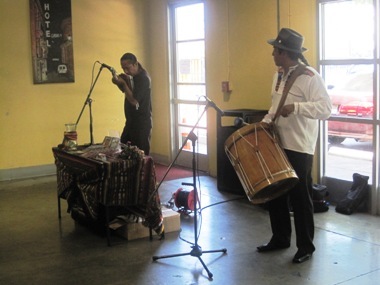 Called “Taste of Mercado La Paloma,” the event celebrated the Mercado’s growth and impact upon the surrounding community by showcasing the best of what it has to offer: food, art, culture, and most importantly, the people that has helped to shape the project during the last decade. 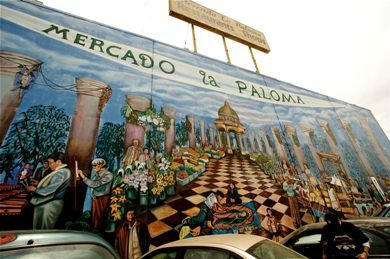 As a division of the Esperanza Community Housing Corporation (ECHC), an organization that strives to achieve long-term community development, Mercado La Paloma continues to be invaluable resource for the surrounding neighborhood by providing residents the opportunities for jobs, education, and healthcare all under one roof. Julie Gutman, Executive Director of Program for Torture Victims (PTV), a non-profit dedicated to helping torture survivors from all over the world rebuild their lives, recounted stories of doing business from unstable work environments before finally coming into the Mercado in 2001. Growing enthusiasm for his national cuisine helped chef Ricardo Zarate achieve his dream of opening a Peruvian restaurant after a decade of frustration. Mr. Zarate, who went to cooking school in Lima, spent 12 years working in high-end Japanese restaurants in London. Convinced that Peruvian food deserved a place on the world stage, he began hunting for investors in 2001, but couldn’t convince enough deep pockets that it was the next big thing. Finally, in 2009, while living in Los Angeles, he pulled together $30,000 and opened Mo-Chica, a stand serving six dishes in a market food court in downtown Los Angeles. Join us for a Community Collaborative Celebration “Recognizing Our Riches!” With you involved, South L.A. will be a healthier place to live! Meet more than 30 community organizations working together to bring more parks, safer streets, healthier food options and affordable housing to our communities. Let’s Learn, Talk and Plan together to Improve South Los Angeles. ¡Si se Puede! Spanish/English translation and child care will be provided. Breakfast and snacks. And some surprises too! Please bring plastic bottles to help support the recycling program at Bethune Middle School. R.S.V.P. Cynthia Rojas at cynthiarojas@socialactionpartners.org or call (213) 493-6543. 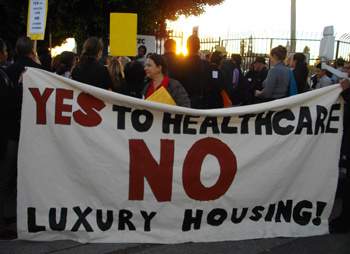 Health as a Human Right in South Los Angeles. 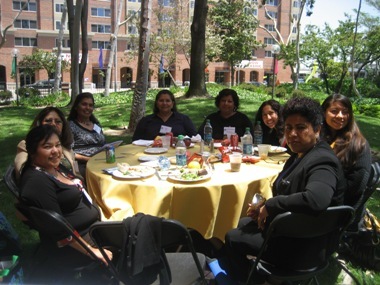 The Los Angeles Neighborhood Initiative Celebrated their Eigth Annual Community Forum at the USC Davidson Conference Center at the USC Davidson Conference Center. The forum included several workshops that highlighted successes and challenges in our community. Worshops: Beat on your Street, Potato Chips to Produce, Promotores, Some like it hot, Community walking groups, gridlocked, L.A.’s Untapped Markets, South L.A. update. 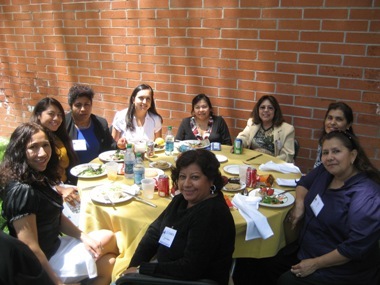 Esperanza Promotoras: Norma Linares, Olivia Mendez, Evelia Castañeda, Rosita Giron, Elizabeth Guevara, Aurora Flores, Norma Benitez, and Maria Bejarano. adventure in new cuisine I have taken. The eatery is located near the campus of USC, at 3655 Grand Avenue. cooking she understood my choice. $5, it almost felt like theft! 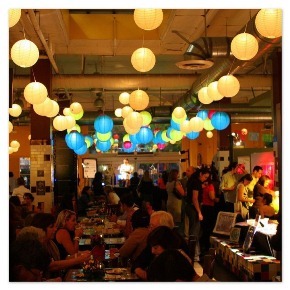 were in a warehouse-like marketplace by the way everything was served. packed a pretty good kick. smothered by our cool, decadent dessert. returning in the very near future to this culinary gem near USC. Oh, yeah, Mo-chica also delivers! Amazing! By Evan ~ August 7th, 2009. Filed under: dining out.